These three galaxies were kind enough to fit in the field of view together. 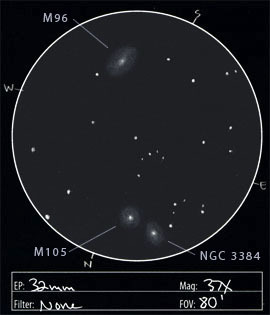 The two galaxies on the north side, M105 and NGC 3384 appeared about 10' apart, nucleus to nucleus. Their nucleii were softly stellar in appearance. M105 appeared basically circular and the brighter of the two, while NGC 3384 was elongated north-northeast to south-southwest. M96 was about 50' to the south. It was the largest and brightest of the three galaxies, elongated northwest to southeast. It didn't have the same stellar nucleus as the other two, it was a bright nucleus, but not as concentrated. Observing all three galaxies at 120X didn't expose more detail, mostly just verified what I had already seen at 37X. M96 is a type Sa spiral galaxy that is the brightest of the Leo 1 group of galaxies, which includes M95 and M105 as well as other fainter galaxies. It lies about 38 million light years away and it's bright inner portion extends about 66,000 light years in diameter. It has a fainter outer ring which extend that diameter to about 100,000 light years. The inner disk is composed of an old population of yellow stars. The galaxy contains a significant amount of dust and blue knots of star forming regions. It was discovered by Pierre Méchain in 1781 and thus cataloged by Charles Messier a few days later. M105 is an E1 elliptical galaxy that is a member of this same galaxy group and so is also about 38 million light years distant. It is often studied as a standard representative of elliptical galaxies. A Hubble Space Telescope survey of the galaxy has shown it to contain a massive central object weighing in at 50 million solar masses. M105 is moving away from us at 752 km/sec. It was discovered by Pierre Méchan a few days after M96, but for some reason wasn't included in Charles Messier's catalog. It was added as M105 in 1947 by Helen Sawyer Hogg along with M106 and M107. NGC 3384 is an E7 elliptical galaxy that contains what appears to be a central bar. It also appears to be a member of the Leo 1 galaxy group. This page contains a single entry by Jeremy Perez published on February 4, 2005 1:45 AM. Messier 44 - The Beehive Cluster was the previous entry in this blog. Messier 79 is the next entry in this blog.